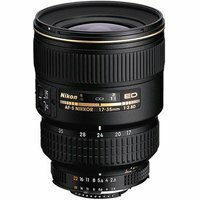 The Nikon 17-35mm f2.8 D AF-S IF is a high performance, wide-angle zoom lens with a bright f2.8 aperture, ultra-quiet Silent Wave Motor (SWM) and fast autofocus operation. This lens covers everything from landscapes and architectural work to portrait and travel photography. Its maximum f/2.8 aperture ensures exceptional clarity, even in difficult lighting situations, and makes it an ideal lens for handheld candid photography. This lens delivers stunning results for both DX- and FX-format Nikon digital SLRs.